vegan cookbook review ~ delicious recipe included! Vegans Eat What? Kathy Patalsky created the blog “ Healthy, Happy Life” in 2007. Since that time she has been populating the blogosphere with her healthy advice and vegan recipes. This book brings together both her sincere desire to help others find their own lifestyle and a diet that will give them the opportunity to find health and happiness. 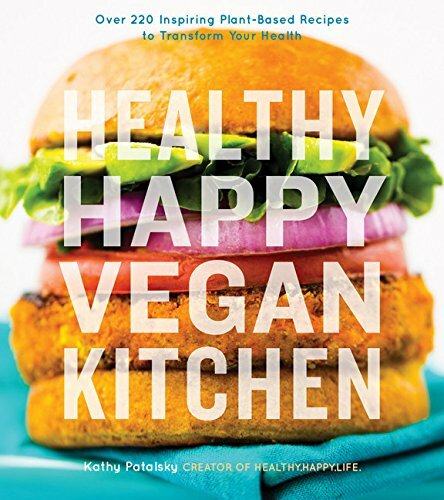 Kathy does this by proposing a vegan lifestyle and provides over 220 recipes to help kick-start a repertoire of delicious dishes. Maybe you are already following a vegan diet? No problem, the recipes we tried will add to your repertoire and were tasty and easy to prepare. A big bonus – they are healthy as well, even for a vegan diet. The book starts off with a well written Introduction chapter. Besides telling the author’s veggie journey, this chapter goes over basic information on a vegan diet and lifestyle as well as some basics on food stuffs and kitchen equipment. It also includes several pages of Kathy’s “Wellness Tips”. The “Wellness Tips” starts by defining what the author means by the term Wellness, which I think is a smart approach. Wellness can mean different things to different The book is graced by ample, mouth-watering photos of the recipes provided. All recipes include nutritional content information, great for those who look for precise information on the content of their food. We tried the Black Rice Peanut Kale bowl with Protein, Vegan Clam Chowder, Wellness Soba Noodle Soup and Home-Style Smoky Pea Soup. They all contained ingredients I found easily at our local markets. The recipes were easy to follow and did not require special equipment or premade “recipe within a recipe”. There are still many more recipes that I want to try. Tasty, healthy, easy to make recipes, I think this book is a winner and I recommend it as one to add to your library. 1. For the Tofu or Tempeh: In a bowl combine tofu/tempeh, maple syrup, tamari and spices. Cover and let set in fridge for at least 10 minutes. Overnight is even better, though not necessary. 2. For the Black Rice: In a large saucepan bring the water to a boil, add a pinch of salt and black rice. Reduce the heat to low, cover and time for 45-55 minutes. 3. For the dressing: combine all the dressing ingredients in a small microwave safe cup. Warm the dressing in a microwave for about 15 seconds. 4. Place kale leaves in a bowl and pour the warmed dressing over them. Massage the dressing into the dale. The kale should wilt a bit and soften as you work with it. 5. Fold in the rice. Toss well. 6. Set a skillet over high heat and drizzle with oil. When oil is hot add the tofu/tempeh and pour the marinade over the top. Cook for 1-2 minutes on each side, just enough time to get a nice blackened sear. 7. Place rice in bowl, cover with kale then tofu/tempeh and lastly the sauce. Serve and enjoy!